This has been one of magic's best kept underground secrets for years. It is a card force and a vanish of the card all at the same time. You ask a spectator to thoroughly shuffle a deck of playing cards. When they are satisfied, you then ask to borrow their driver's license. They stick their driver's license into the deck anywhere they want and are asked to simply look at the random card next to where they stuck their license. They have now chosen a card in the fairest possible manner and are thinking of it in their head. Now... the miracle. You ask them to go through the deck and find the card they were thinking of and... yes, it is gone! The card they are just thinking of can reappear in your wallet, inside your shoe or any other place your creativity takes you. The cards are shuffled, and the spectator has a truly free choice to touch the back of any card in the deck. You now open the deck up like a book to show them their card as you clearly turn your head away. You should have no idea what card they have chosen and are now thinking of... but of course you do. This is one of the cleanest and most deceptive forces on the planet and just when you thought it couldn't get any better, on this download you will also learn how this force can double as a card control as well. 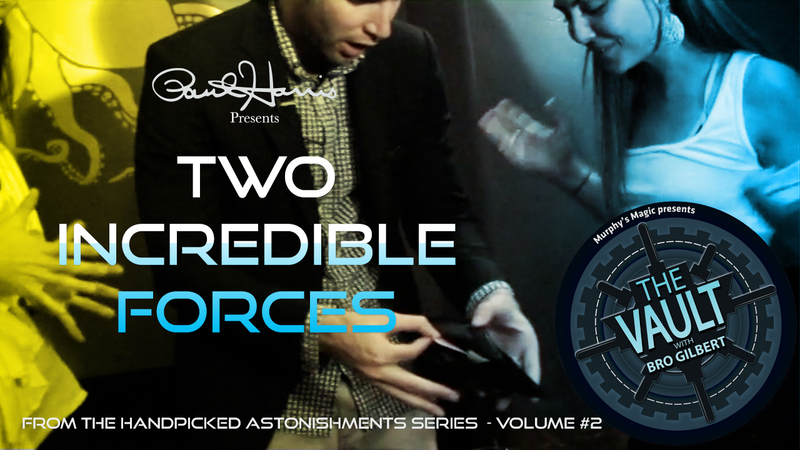 Note: Both of these forces (and the demo video above) were taken from The Handpicked Astonishments Series Volume #2 and we highly suggest that you purchase the full download if you enjoy these two exceptional forces. The demo video is showing what is with the entire Volume 2 download and not simply the two forces explained above which you will receive with this purchase. The Touch Force is my new go-to force. It's also a card control. So convincing and flies under the radar. Very easy to do with a little practice...like 10 minutes at most. For the money, it's a great force that most magicians never heard of. Fiedler's Flyer is easy, quick and astonishing. A little audience management is necessary. Just make sure that you pick up their driver's license off the table before they do.